When Ford decided to reinvent its venerable truck-based Explorer SUV as a car-derived crossover for 2011, no one was particularly surprised. The old Explorer was a family vehicle with a family-unfriendly design; the new Explorer addressed this with its roomier interior, smoother ride, and significantly improved fuel economy. But there’s a big surprise in store for 2012. Apparently unsatisfied with the standard 3.5-liter V-6’s 25 percent fuel-economy improvement over the previous V-6, Ford has decided to offer a turbocharged 2.0-liter four-cylinder engine in front-wheel-drive Explorers. Let’s put this in perspective. We asked ourselves if there’s ever—EVER—been such a diminutive engine in a 4,500-pound-plus vehicle. “Probably not,â€ was our considered reply. Granted, Ford’s four-cylinder “EcoBoostâ€ motor is rated at 240 horsepower and a robust 270 pound-feet of torque, but still—a boosted 2.0-liter four is something we associate with sport compacts, not hulking three-row people-movers. So how’s it work? Pretty well, actually. Most remarkable is the leap in fuel economy: whereas the front-wheel-drive Explorer V-6 gets 17 miles per gallon in city driving and 25 mpg on the highway, the Explorer EcoBoost cranks it up to 20 mpg city and a robust 28 mpg highway. But the turbocharged Explorer also does a decent job of getting out of its own way. The only catch is that Ford actually charges $995 more for the four, so be prepared to pay extra for the privilege of driving one of the most efficient large crossovers on the market. 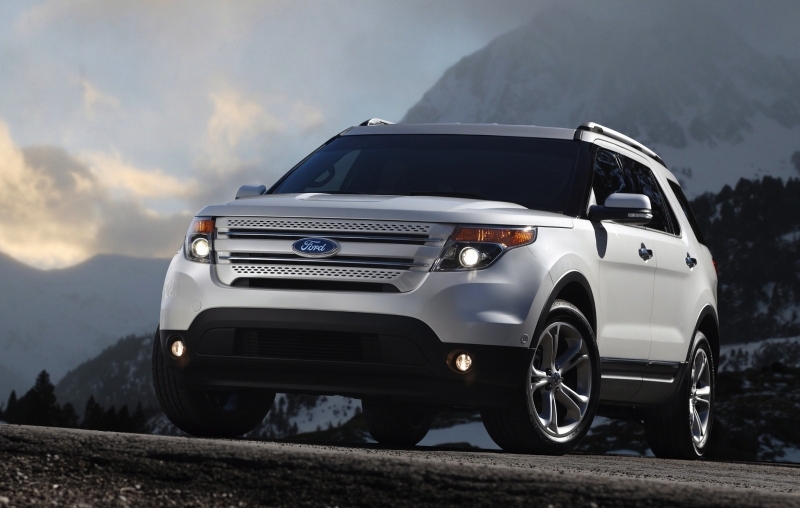 The Explorer EcoBoost delivers excellent fuel economy for an imposing three-row crossover. The turbocharged engine does its work subtly, rarely giving hints about its true nature. 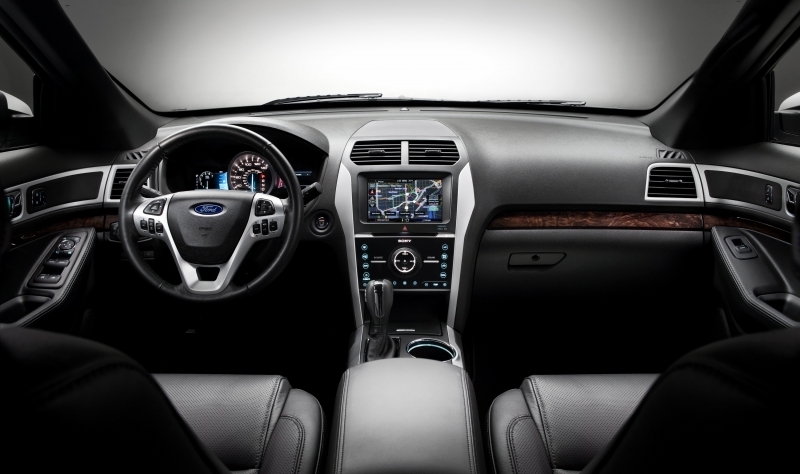 Like other Explorers, the EcoBoost features a notably upscale cabin with generally high-quality materials. The seats are comfortable, and even full-sized adults can fit reasonably well in the third row. Thanks in large part to the Explorer’s car-derived platform, this is an exceptionally smooth-riding vehicle. Shoppers in colder climes will be disappointed to learn that the EcoBoost engine is only available with front-wheel drive. The second-row seat lacks legroom when taller folks are sitting up front, and third-row access requires more effort than some parents might like. The optional MyFordTouch system requires more operator attention than it should. Finally, towing capacity is severely compromised with the EcoBoost engine and it costs an extra grand. Despite its pleasantly compact steering wheel, the Explorer drives big—it may be based on a car platform, but it feels more like a minivan from behind the wheel. The expansive dashboard and high ceiling add to the effect. Once underway, the Explorer remains remarkably quiet until you reach freeway speeds, and even then the noise levels are unobtrusive. We have to hand it to Ford’s acoustic engineers on the engine front, too—only obsessively observant drivers will hear or feel that there’s a turbo at work, and while we did note some faint four-cylinder whininess at higher rpm, few people will notice. There’s not much athleticism to speak of in the chassis, but the steering is surprisingly responsive in evasive maneuvers. On rough roads, impacts are sometimes more vivid than we’d like, but generally the Explorer rides with confident compliance. The front-wheel-drive Ford Explorer EcoBoost is motivated by a direct-injected, turbocharged 2.0-liter four-cylinder engine rated at 240 horsepower and 270 lb-ft of torque - on good old 87 octane, no less. The transmission is a smooth and obedient six-speed automatic. The little four-cylinder is a bit like a diesel in that its ample torque makes you feel like you’re accelerating more quickly than you are; still, there’s enough pep here to satisfy most families. Note, however, that the standard 290 horsepower, 3.5-liter V-6 feels quicker, and you’ll want it if you care about towing capacity, which is 5,000 pounds with the V-6 versus a measly 2,000 pounds with the turbo four. In addition to MyFord Touch, which is discussed below, the Explorer offers a whole bunch of niceties, including second-row captain’s chairs (Limited only), an automatic self-parking system, a rear-seat entertainment system with headrest-mounted screens, and an excellent navigation system. There’s also an interesting offering on the safety front: the Explorer has industry-first seatbelt-mounted airbags in the second row – the Explorer aced the standard crash test performed by the Insurance Institute for Highway safety. 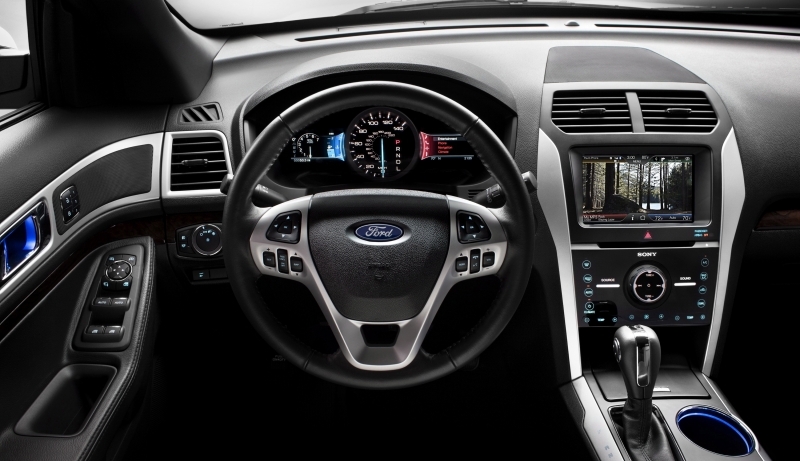 The much-maligned MyFord Touch, Ford’s optional touch-screen interface for most vehicle functions, is a key part of the company’s future. It's caught its share of flak from critics for being unnecessarily complicated, but we don’t really think it’s that bad, especially for people who are familiar with computers. Trouble is, there’s a lot of text in the interface, and not a lot of user-friendly icons to push. That means increased driver distraction and/or passenger frustration. 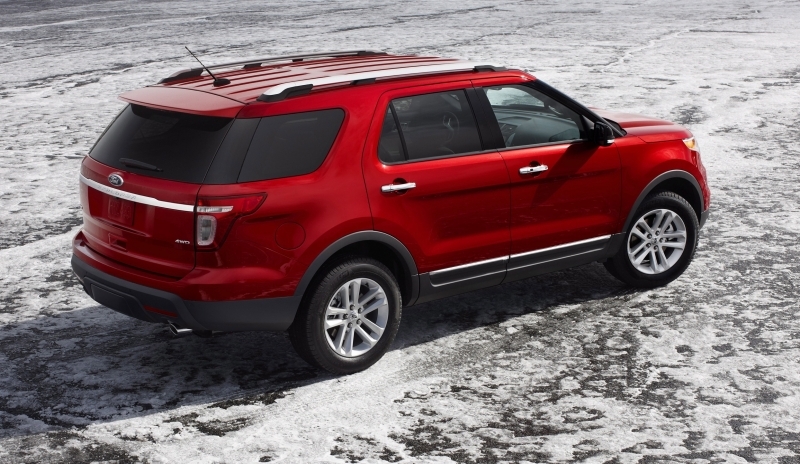 The Explorer EcoBoost is rated at an impressive 20 mpg in the city and 28 mpg on the highway. Not bad for a 4,500-pound SUV; not bad at all. In fact, not bad for a midsize sedan - the 2011 Toyota Camry V-6 yielded a virtually identical 20/29 mpg. The Explorer has a sleek, refined dashboard that’s covered with mostly high-quality material—the only false note in our test vehicle was a clear misalignment of the interior door panels relative to the dashboard. But let’s talk third-row seating. On the bright side, a couple adults will fit just fine in the way-back; however, getting passengers situated in the third row can be a pain. While the second row seats come with a standard power-fold function, it only works when you’re folding the seats down, after which you’ll have to snap those seats back into place manually. This requires a fair amount of strength, so make sure you try it out at the dealership. For its 2011 redesign, the Explorer ditched its rear-wheel-drive truck platform in favor of a front-wheel-drive car platform. The change is readily apparent; the new Explorer looks like a big tall wagon - a more outdoorsy version of its Flex sibling. And it certainly looks cooler than a minivan. The Explorer faces domestic competition from the Chevrolet Traverse and Dodge Durango, while the Honda Pilot, Hyundai Veracruz, Mazda CX-9, and Toyota Highlander are among its international foes. Worthwhile minivan alternatives include the Chrysler Town & Country, Honda Odyssey, Nissan Quest, and Toyota Sienna. 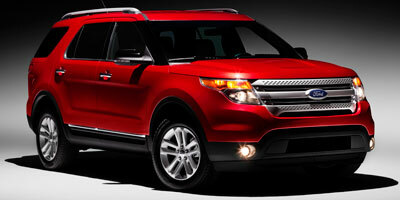 Pricing starts at $29,990 for the Ford Explorer Ecoboost. If you’d told us a year ago that a 240-horsepower four-cylinder engine could hold its own in a 4,500-pound crossover, we probably would have chuckled. But Ford has wiped the grins off everyone’s faces with this new turbocharged Explorer. All things considered, it's one of the best three-row crossovers you can buy.